The Nocturne, as you may have guessed by its appearance, is a party Champagne. It is built to be easily (and happily) consumed and shared in groups to round out an evening in style. 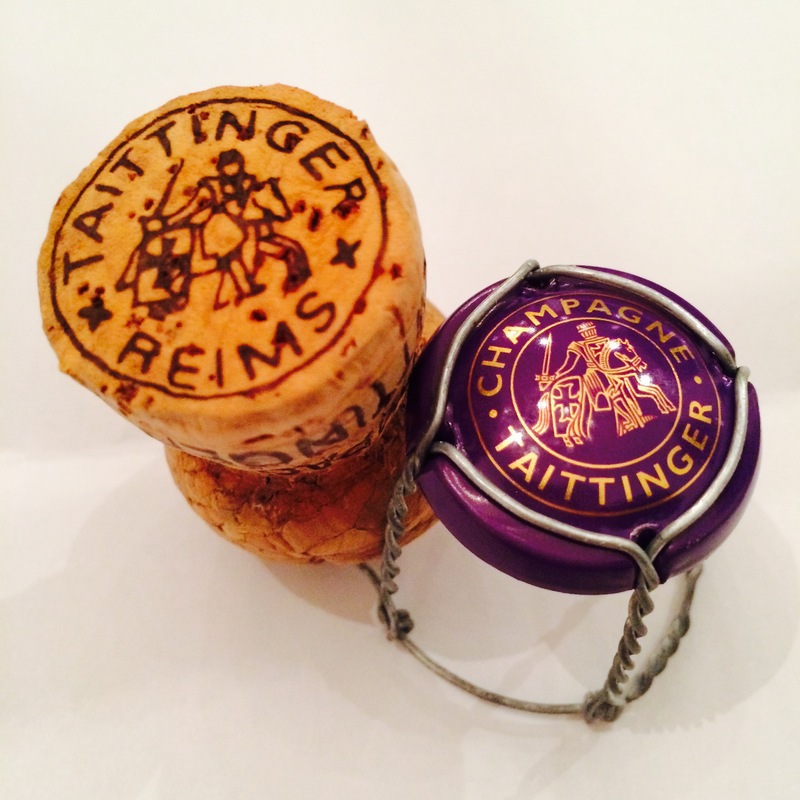 This is not at all to say that it’s lacking in substance, however, as the classic craftsmanship of the Taittinger name is still readily apparent. Part of the Nocturne’s universal appeal is rooted in the fact that it receives a fairly hefty dosage (added liquid cane sugar after disgorgement), leaving some residual sweetness to lend heft and approachability to the wine’s complex flavours. 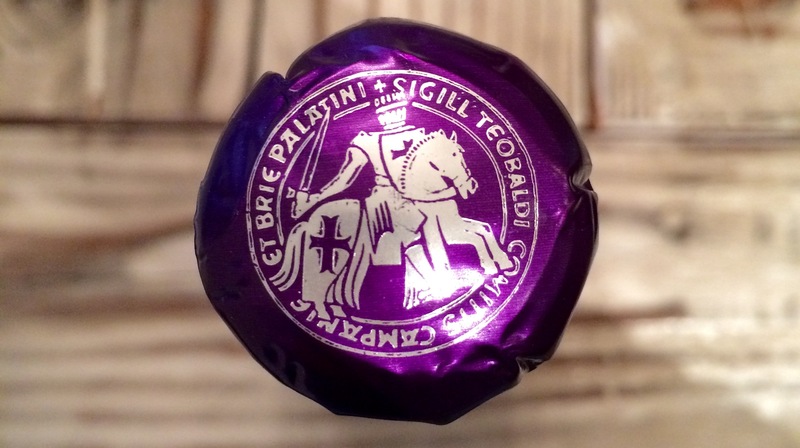 This may be the part of the review where you look at the bottle and say: “Residual sugar? Sweetness? But doesn’t it say ‘Sec’ on the label?” Um, yes…about that. “Sec”, when it comes to Champagne, may be the most misleading term in the wine world today. Even though the word directly translates to “dry”, in this context, it means exactly not that. By law, every Champagne has to designate the level of its dosage (added/residual sweetness) on its label through the use of a specified sweetness level. These levels range from Brut Nature (no dosage) up to Doux (50+ g/L of residual sugar). Sec is closer to the Doux than the Brut Nature designation on the sweetness scale and means that there is between 17 and 32g/L of residual sugar in the wine, making it rather emphatically off-dry. “Brut” is the term that would represent wines that most people would consider to be dry. Who says learning about wine is hard? The Nocturne is on the lower end of the Sec sweetness spectrum but still clocks in at 18 g/L of sugar dosage, which prompts Taittinger’s website to recommend drinking it with dessert or as the last bottle opened at the end of the night. However, I think this sells the versatility of this Champagne a little bit short, particularly since both the effervescence of the wine and its vivid, crisp acidity serve to mask and balance out the sweetness. There’s no reason this bottle can’t be enjoyed at any time over the course of an evening, including with dinner (which is when I had mine). 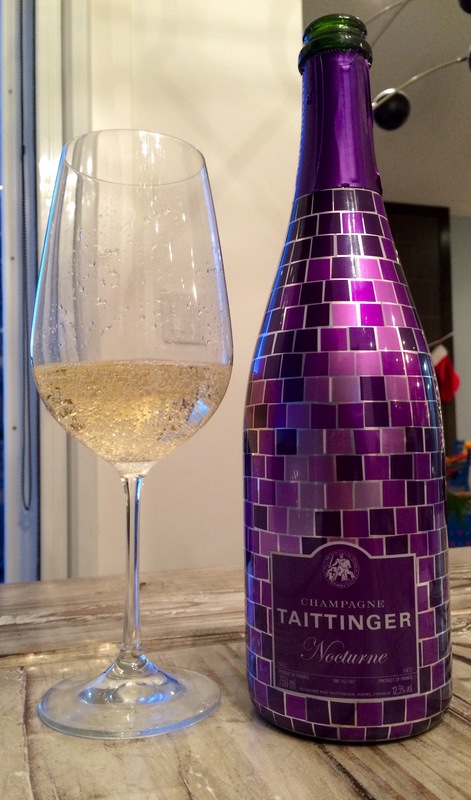 Taittinger makes use of all three allowable Champagne grapes to make this cuvee, which is comprised of 40% Chardonnay, 35% Pinot Noir and 25% Pinot Meunier. It’s a non-vintage blend of about 35 different base wines from multiple harvest years, carefully compiled in a manner that preserves Taittinger’s house style and aged in bottle on its lees for 4 years before disgorgement for added character and complexity. The Nocturne flowed out of its Disco bottle with a very fine and persistent mousse (translation: very small bubbles that don’t go away even after a while in the glass, a sign of quality and traditional production methods) and warm and toasty aromas of tarte tatin, cinnamon sticks, golden apple and fresh baked bread. There was an amazingly distinct black fruit note on the palate of this white sparkler, tangy blackberry and blackcurrant, interwoven with lemon curd, meringue, Asian pear, brioche, and a salty mineral tang that kept the lush, generous flavours in check. I spent a couple hundred words above going on about the sweetness level of the Champagne and the substantial dosage, but despite the dessert-inclined flavour descriptors above, there was very little overt sweetness to this wine, just a fullness of texture and an added richness and juiciness that revealed the dosage’s contribution to the end product. There is a slight trace of confectionary sugar on the lengthy finish, mixed with blackberries and smoke, but otherwise the sweetness is very well integrated and neither jarring nor even blatantly evident. You may have noticed from the picture above that I drank the Nocturne out of a standard white wine glass as opposed to a Champagne flute. There is a rather vigorous debate currently going on in the wine world about the proper vessel to use when drinking sparkling wine. The flute is the predominant choice and is used mainly for esthetic reasons: it’s tall and slender and gives you the best visual of the stream of bubbles climbing to the top of the glass. It also exposes less of the surface area of the wine to the open air and thus (arguably) maintains the carbonation longer. However, there is a growing movement towards enjoying Champagne and other sparklers as complete wines instead of as carefree fizz, and drinking them out of a normal wine glass allows you to better detect and appreciate the myriad of complex aromas that are created through their production and maturation. Riedel, probably the best known quality wine glass maker in the world, has recently set out on a mission to make Champagne flutes totally obsolete for this reason. I chose a standard glass in this case to give myself the best chance to pull out what the wine was trying to say since I then had to put it in writing for you. That said, when you’re popping some bubbly, especially one out of a purple disco ball bottle, try not to get wrapped up in too much minutiae. Just celebrate. Happy holidays! What a great review! Your site has been bookmarked for return visits. Thanks a lot – very much appreciated!